June 29, 2016 – Scheduled for launch on September 8, NASA’s OSIRIS-REx mission will travel to an asteroid, study it and return a sample to Earth for analysis. All of these goals depend on accurate mapping of the target, Bennu, so the team is gearing up for the challenges of cartography of an asteroid. 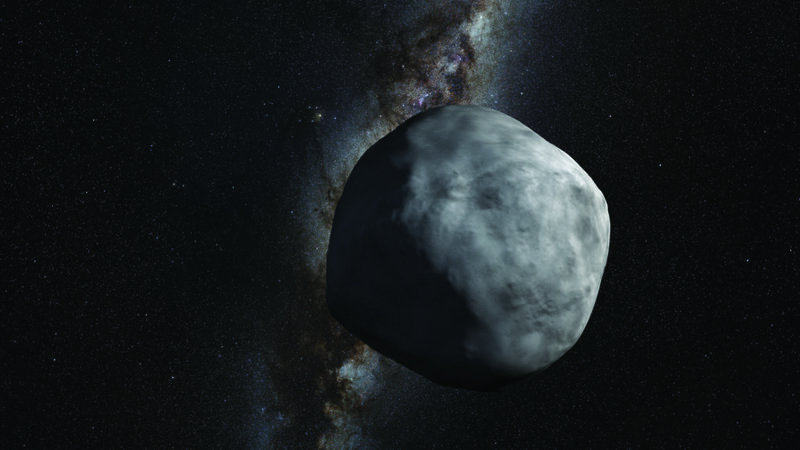 “Mapping of Bennu is necessary, of course, but it’s also an exciting and technically interesting aspect of the mission,” said Ed Beshore, OSIRIS-REx deputy principal investigator at the University of Arizona in Tucson. The mission is managed by NASA’s Goddard Space Flight Center in Greenbelt, Maryland. The maps will be generated using information gathered by the five instruments aboard OSIRIS-REx, which stands for Origins, Spectral Interpretation, Resource Identification, Security-Regolith Explorer. Upon its rendezvous with Bennu, the spacecraft will spend a year surveying the asteroid for both scientific and operations purposes – including searching for plumes of material coming from the asteroid, measuring non-gravitational forces acting on Bennu, and identifying the best location to collect a sample. Most of the mapping work will be done during this survey phase. The team will document the shape of the asteroid, generate a suite of top-level maps, and perform reconnaissance on the final few candidates on the list of possible sampling sites. The reconnaissance maps will be so detailed that team members will be able to spot individual pebbles measuring about three-fourths of an inch (2 centimeters) across – roughly the maximum size of material that the sampling head can collect. “Everything the spacecraft learns will be woven together like a tapestry to tell the story of Bennu,” said Kevin Walsh, an OSIRIS-REx co-investigator at the Southwest Research Institute in Boulder, Colorado. In the meantime, the groundwork for mapping is being laid. The underlying framework is a 3-D shape model. This step is crucial because asteroids, unlike planets and moons, aren’t nice and round. They tend to be bumpy and irregular, often like potatoes. Bennu is more of a lumpy ball that gets thicker around the middle – a shape astronomers compare to a spinning top. This rough shape was determined from radar studies conducted from Earth since the asteroid’s discovery in 1999. After OSIRIS-REx surveys Bennu, a new model that captures the subtleties of the asteroid’s shape will be developed. For the global maps, information from the spacecraft’s instruments will be overlaid on the shape model. The team plans to incorporate some of these 3-D maps as a routine part of mission-critical operations. Three top-level operations maps are planned: one to evaluate which areas are safe enough to allow the spacecraft to move close to the asteroid, one to determine where the sampling arm can make good contact with the surface to perform its touch-and-go maneuver, and one to indicate where to find the material most suitable for sampling. A fourth top-level map will evaluate how scientifically valuable different regions of the asteroid are. Preparations also include establishing map conventions, such as specifying which of Bennu’s poles is north. The team based this decision on the direction of the asteroid’s rotation – a choice that fits with guidelines from the International Astronomical Union. Bennu spins in the direction opposite to Earth, so the asteroid’s poles are reversed compared to our planet’s poles. The location of Bennu’s prime meridian – zero degrees longitude – also has been chosen. It runs through a large bump seen on the preliminary shape model. Later, this selection will be refined, or perhaps redefined, depending on what Bennu looks like up close. Navigation is another special consideration when mapping Bennu. Because the asteroid is so small, its gravitational force is very weak, accounting for only about half of the total force the orbiting spacecraft will feel when it’s close to Bennu. The other half will come from pressure due to sunlight on the surface of the spacecraft. The pressure exerted by sunlight is difficult to model, so the navigation team will have to perform frequent updates – perhaps daily. The instrument teams will have to adjust quickly to the changes in plans. NASA Goddard Space Flight Center in Greenbelt, Maryland provides overall mission management, systems engineering and safety and mission assurance for OSIRIS-REx. Dante Lauretta is the mission’s principal investigator at the University of Arizona, Tucson. Lockheed Martin Space Systems in Littleton, Colorado built the spacecraft. OSIRIS-REx is the third mission in NASA’s New Frontiers Program. NASA Marshall Space Flight Center in Huntsville, Alabama, manages New Frontiers for the agency’s Science Mission Directorate in Washington. Launch management is the responsibility of NASA’s Launch Services Program at the Kennedy Space Center in Florida. OSIRIS-REx will launch on a United Launch Alliance Atlas V.